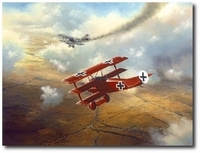 The first military airplane flight west of the Appalachian Mountains took place above Fort Sam Houston�s Arthur MacArthur Field on March 2, 1910 with Lt. Benjamin Foulois at the controls. 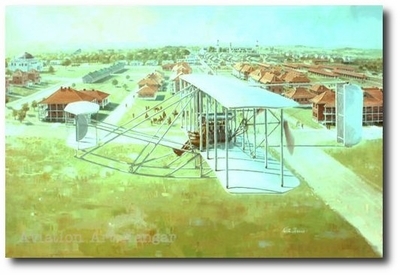 �Gallant Beginning� depicts Lt. Benjamin Foulois during the first military flight west of the Appalachians, at Fort Sam Houston, Texas on March 2, 1910. Lt. Foulois had been ordered to accompany military airplane number one to Fort Sam Houston, assemble it and teach himself how to fly. The painting was commissioned by the Bank of Fort Sam Houston (now Bank of America Military Bank) in 1975. The print edition was 1,000 when published. A portion of these prints was used in a special limited edition, signed, numbered and personalized by the artist for special presentation by the bank. The prints now being made available on this web site have been provided through the generosity of Bank of America Military Bank, San Antonio, Texas.